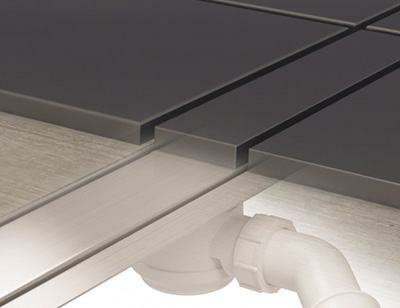 Wall Upstand drain channel is 84 mm wide and it comes with included Mistral stainless steel grate. Mistral pattern features a regularly placed circles of various size along the entire grate, which is 64 mm wide and 994 mm long and total drain length with insulation flange is 1060 mm. Sealing membrane is a blue non-woven fabric which bonds well in the glue and is resistant to cracking. Wall Upstand drain channel is 84 mm wide and it comes with included Tivano stainless steel grate. Tivano pattern features regurarly placed L-shaped rectangles with a square inside, which is 64 mm wide and 994 mm long and total drain length with insulation flange is 1060 mm. Sealing membrane is a blue non-woven fabric which bonds well in the glue and is resistant to cracking. Wall Upstand drain channel is 84 mm wide and it comes with included Sirocco stainless steel grate. Sirocco pattern which is considered to be the most practical pattern, features 3 rows of square shaped holes running parallelly to cover edge, which is 64 mm wide and 994 mm long and total drain length with insulation flange is 1060 mm. Sealing membrane is a blue non-woven fabric which bonds well in the glue and is resistant to cracking. Chat started. Session ID: 1556250057. You are now connected to: David M.